Most bloggers are always in search of ways to monetize their blog and get a good income from blogging. Some might even say what is the essence of blogging when you can’t generate revenue with it. However, bloggers now find it difficult these days to get accepted into the Google Adsense network due to Adsense strict rules and some other factors. Most websites are even suffering from a ban from Google Adsense. After a lot of trials to get approved by Adsense, most people get frustrated and abandon blogging and for some people, it might be what they know how to do best. I will be introducing to you an Adsense alternative which you can use to monetize blog without Adsense and make money blogging. I will be talking about Revenue hits, which is one of the top most reliable Adsense alternatives you can use to monetize your blog. Revenuehits is one of the best ad networks that give you a good ROI (Return on Investment). Revenuehits is operated and owned by Intango, which is a private startup established in 2008 by a team of tech professionals. It is designed to monetize your blog and optimize traffic on your blog. 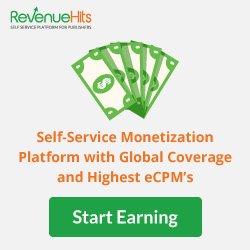 This article will highlight precisely the awesome features of Revenuehits, how it works and how you can join to Monetize Blog without Adsense. Revenuehits have the easiest signup process of all. You don’t have to abide by some hard rules when signing up for Revenuehits and wait for several days or weeks before your application is approved. Some ad networks such as Google Adsense spend days or even weeks to review your application before you can get approved, however, it’s not even certain that your application will be approved. Hence, all you need to do with Revenuehits is to fill a short signup form and boom!! You just became a publisher to monetize blog without Adsense! There is no entry barrier when it comes to Revenuehits, you can start running it almost immediately after signing up. You are free to use Revenuehits on your site no matter the number of page views or website traffic unlike some other networks where you have to manage certain number of monthly traffic. However, Revenuehits is not niche selective, and it works with all available blogging niche. You can easily use it with other ad networks also, provided that you are using some other ones already. Most people like to avoid complications when running things from the back-end, most bloggers even find it difficult to operate their blog dashboard. Nevertheless, Revenuehits has an intuitive and well-designed dashboard where you can monitor analytics and statistics of your ad performance, which includes clicks, eCPM, impressions and all other stats. Other ad networks like Adsense allows a minimum payout of $100 through wire transfer and some other means of payment which is higher. It will amaze you to know that once your account reaches a threshold of $20 on Revenuehits, you can withdraw your funds. I must confess that is just about the lowest I have ever come across. So you don’t have to attain $50 or $100 before you can withdraw your funds. This will take me to the next point. These are the three unique ways you can get to withdraw your funds, and it’s just as easy as it gets. All payment methods are accepted worldwide regardless of your location which makes it easy to monetize blog without Adsense. However, the desktop ad placement has 9 different ad segments. Button Ad: This shows button ad type beside your blog sidebar. Banner Ad: You can get to choose different banner sizes. 728×90 Footer: This creates a sticky footer ad size. 468×60: This also creates a sticky footer ad size. Interstitial: This ad segment shows link based ads. After applying the code, Revenuehits will automatically select some keywords on your blog as an external link. If the link is clicked, people will see a popup based on that keyword. Pop-under: This creates a popup ad. Top Bar: This shows a sticky top bar ad, which is also called the Leaderboard. Slider: This shows a slider ad close to your blog sidebar. Shadow Box: This ad type creates a shadow ad inside the blog post. That’s about it for the desktop ad type. The Mobile has 5 different ad segment types. Interstitial: This works similarly as the desktop version. Notifier: This also works similarly as the top bar ad. New Tab: This creates a pop up ad that opens in a new tab. Footer: A footer ad bar. Mobile Dialog: This offers only app downloads, and it’s a popup ad also. Revenuehits offers an amazing referral program which allows publishers to get rewarded for introducing into the program, isn’t this great? Here is a simple breakdown of how it works. When you refer a publisher, for a publisher with monthly revenues up to $1500, you will receive 5% share from his earnings for one year. 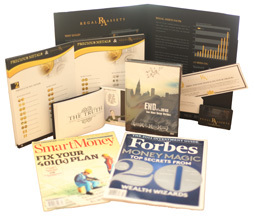 For a publisher with monthly revenues over $1500, you will receive 10% share from his earnings for one year. Their referral program is another way to monetize blog without Adsense. Their support team is always in contact and are always happy to help you optimize your ads to increase revenue. Should in case you are having issues, your request will be answered within a short period and no later than 48 hours. 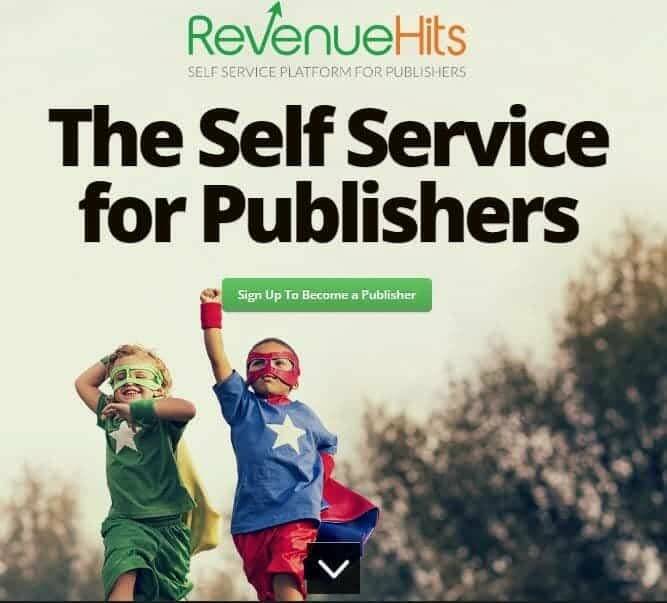 Visit Revenuehits website and signup as a publisher, and you will be approved immediately. You will also need to supply your blog URL and category. Revenuehits has recorded successful verticals when it comes to niches such as Shopping, Dating, Travel, Entertainment, Mobile, Gaming and more. Why not give Revenuehits a trial and start making cash from your blog. And the best part is Revenuehits are putting on one of the hottest contest of the summer, where you can win an all-inclusive trip to the 2016 Rio Olympics. 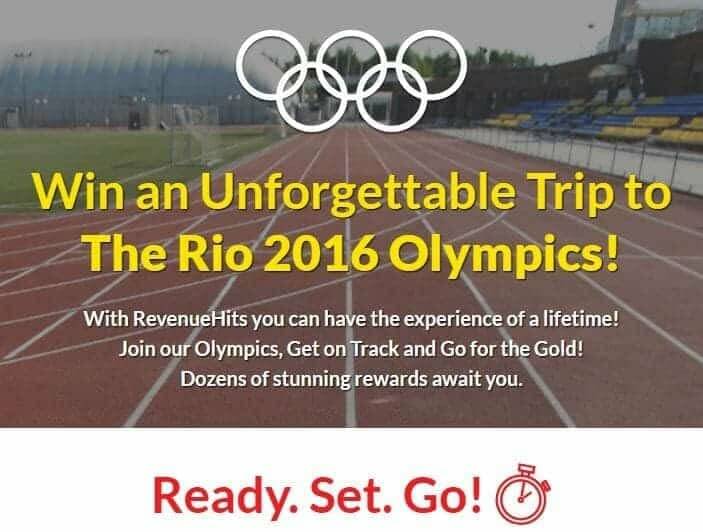 Once you sign up as a Publisher, you can enter RevenueHits Olympics Competition. Don’t miss your chance to monetize blog without Adsense PLUS win a trip to Olympics. Sign Up Here!